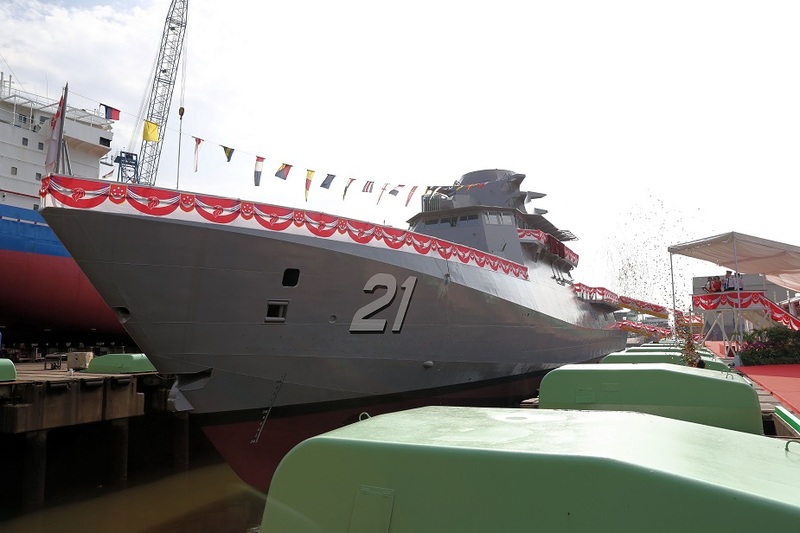 ST Engineering’s Marine sector on August 18, 2018 launched the seventh Littoral Mission Vessel (LMV), Dauntless, designed and built for the Republic of Singapore Navy (RSN). Held in a ceremony at ST Engineering’s Benoi Yard, the launch was officiated by Mr. Heng Swee Keat, Minister for Finance. Mr. Heng’s spouse, Mrs. Heng Hwee Nee was the lady sponsor who named and launched the vessel in accordance with naval traditions. The event was witnessed by senior officials from the Ministry of Defence and the Singapore Armed Forces. The LMV programme that started in 2013 will replace the RSN’s current fleet of Fearless-class Patrol Vessels, also designed and built by ST Engineering’s Marine sector in the 1990s. The LMVs are 2.5 times larger, and possess better seakeeping capabilities to operate in higher sea state conditions, amongst other attributes. «We are excited to launch the seventh of eight LMVs that we are designing and building for the RSN. We are committed to continue the good progress we have made thus far, and look forward to completing the programme with the last and final LMV», said Ng Sing Chan, President for ST Engineering’s Marine sector. ST Engineering’s Marine sector has delivered five vessels till date – LMV Independence, LMV Sovereignty, LMV Unity, LMV Justice and LMV Indomitable. The sixth vessel, LMV Fortitude was launched in March this year, and the keel for the eighth LMV was laid a month after. 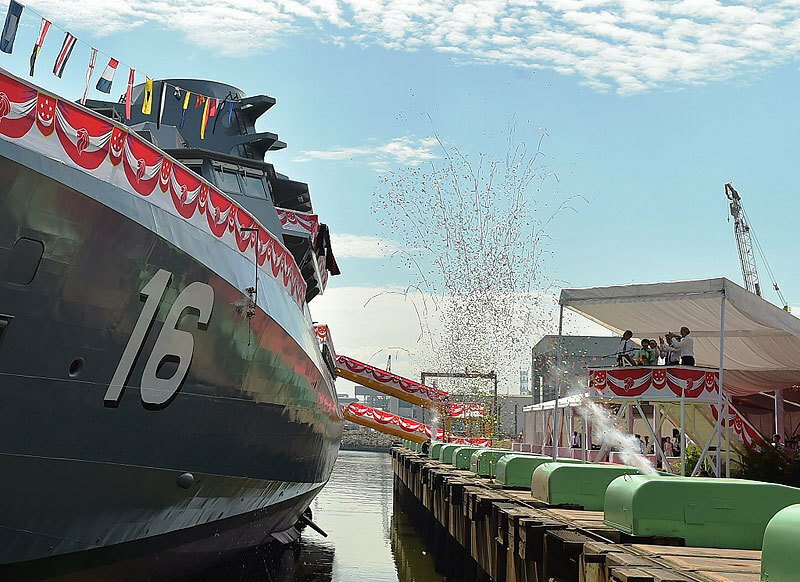 Singapore Technologies Marine Ltd (ST Marine), the marine arm of Singapore Technologies Engineering Ltd (ST Engineering), has successfully launched the sixth Littoral Mission Vessel (LMV), Fortitude, designed and built for the Republic of Singapore Navy (RSN). The ceremony, held at ST Marine’s Benoi Yard, was officiated by Mr. Ng Chee Meng, Minister for Education (Schools) and Second Minister for Transport. Mr. Ng’s spouse, Mrs. Michelle Ng was the lady sponsor who named and launched the vessel in accordance with naval traditions. The event was witnessed by many senior officials from the Ministry of Defence and the Singapore Armed Forces. Fortitude is part of an eight-vessel LMV programme started in 2013 and is slated to replace the RSN’s current fleet of Fearless-class Patrol Vessels, also designed and built by ST Marine in the 1990s. The LMVs are 2.5 times larger and possess better sea-keeping capabilities to operate in higher sea state conditions, amongst other attributes. «The launch of the sixth LMV Fortitude today brings us another step closer to the completion of the LMV programme. The milestones to date could not have been achieved without the collaboration of the DSTA, RSN and our industry partners, and I extend my warmest appreciation to them», said Ng Sing Chan, President for ST Marine. 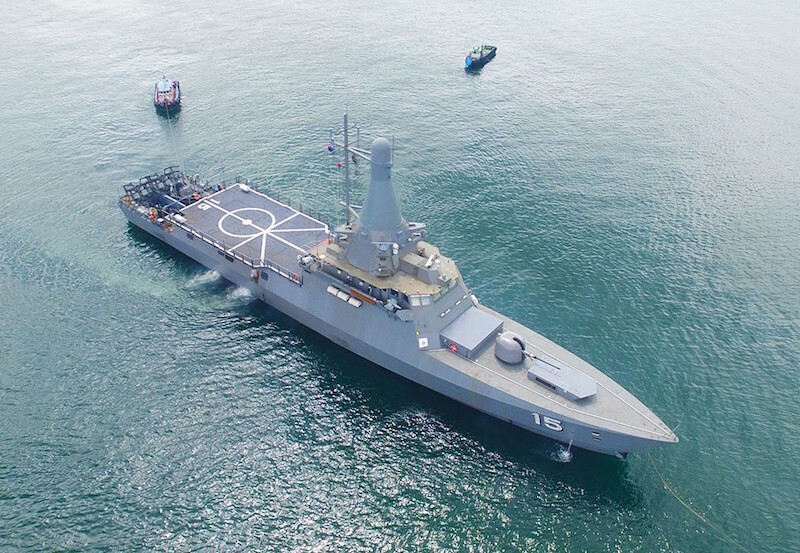 «We are honoured to be able to contribute to RSN’s robust seaward defence of Singapore, which will be strengthened further when all eight LMVs are delivered in 2020». According to defense-aerospace.com, Senior Minister for State for Defence Dr. Mohamad Maliki Bin Osman officiated at the launching ceremony of the Republic of Singapore Navy (RSN)’s fourth Littoral Mission Vessel (LMV), Justice, at the Singapore Technologies Marine (ST Marine)’s Benoi shipyard on March 17, 2017. The LMV was launched by Mdm Sadiah Shahal, wife of Dr. Maliki. Speaking at the ceremony, Dr. Maliki highlighted that given the increasingly volatile maritime domain, the LMVs aptly illustrate how the RSN is «looking ahead to the next 50 years to make sure it stays relevant and ready for the challenges ahead». He added, «the RSN has designed the LMV to conduct a wider range of operations in a more complex environment. It will give the RSN greater mission flexibility and sustainability». The launch of Justice is another significant milestone in the RSN’s continued transformation to keep Singapore’s seas safe. The LMVs are faster, more versatile, and equipped with sharper capabilities to further strengthen the RSN’s effectiveness in seaward defence. The LMVs can be quickly configured with mission modules to take on a wide spectrum of operations, allowing the crew to deliver calibrated responses using lethal and non-lethal options to deal with a range of maritime threats. The LMV project is progressing well, with LMV Justice expected to be fully operational by 2018, and all eight LMVs by 2020. 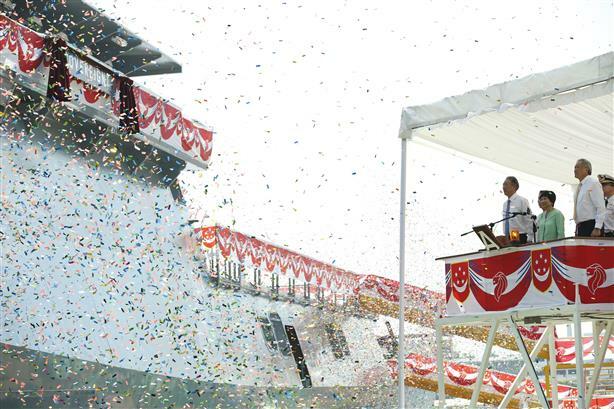 The first three LMVs, Independence, Sovereignty and Unity, are presently undergoing sea trials and LMV Independence will be commissioned during the RSN’s Golden Jubilee on 5 May 2017. Also present at the ceremony were Chief of Navy Rear-Admiral Lai Chung Han and senior officials from the RSN. 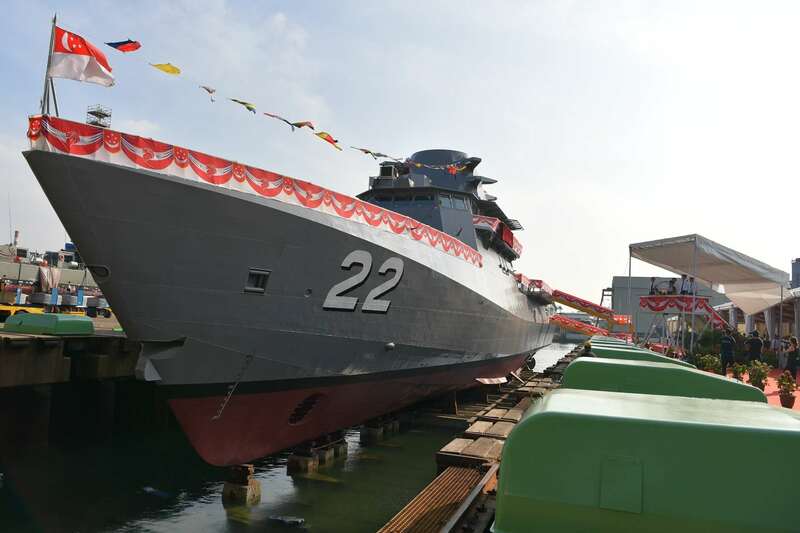 Singapore Technologies Marine Ltd (ST Marine), the marine arm of Singapore Technologies Engineering Ltd (ST Engineering), held the Launching Ceremony on April 16 for the second Littoral Mission Vessel (LMV), RSS Sovereignty, designed and built for the Republic of Singapore Navy (RSN). The Launch Ceremony was officiated by Mr. Teo Chee Hean, Deputy Prime Minister and Coordinating Minister for National Security. 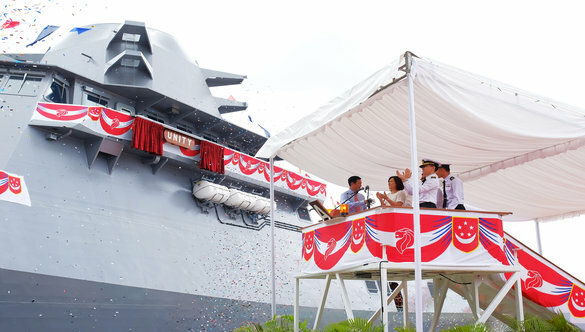 Initiating the launch of the vessel at ST Marine’s Benoi Yard was DPM Teo’s wife, Mrs. Teo Chee Hean. The event was witnessed by Dr. Ng Eng Hen, Minister for Defence; Dr. Mohamad Maliki Bin Osman, Senior Minister of State for Defence, and many senior officials from Ministry of Defence (MINDEF) and the Singapore Armed Forces (SAF). 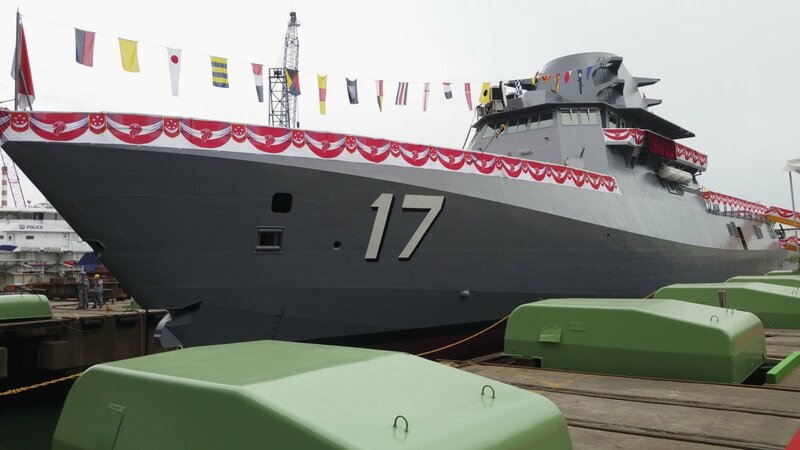 The launch of RSS Sovereignty, the second LMV in a series of eight vessels, marks another significant milestone for the LMV programme. Smarter, faster and sharper, the LMVs are highly capable warships designed and equipped with advanced combat capabilities and technologies to further strengthen the RSN’s ability in the seaward defence of Singapore and protecting our sea lines of communication. The Integrated Command Centre, where the Bridge, Combat Information Centre and Machinery Control Room are co-located, integrates and synergises the management of navigation, engineering, and combat functions to achieve greater operational effectiveness and efficiency during maritime security operations. Adopting the concept of «mission modularity», these vessels are versatile and can leverage a range of mission modules that can be reconfigured to respond to different circumstances and roles, ranging from maritime security and mine clearing, to humanitarian assistance and disaster relief operations. Measuring 262.5 feet/80 m in length and beam at 39.4 feet/12 m with displacement of 1,250 tonnes, the LMVs are 2.5 times larger than the current Fearless-class Patrol Vessels (PVs) and possess better sea-keeping capabilities to operate in higher sea state conditions. 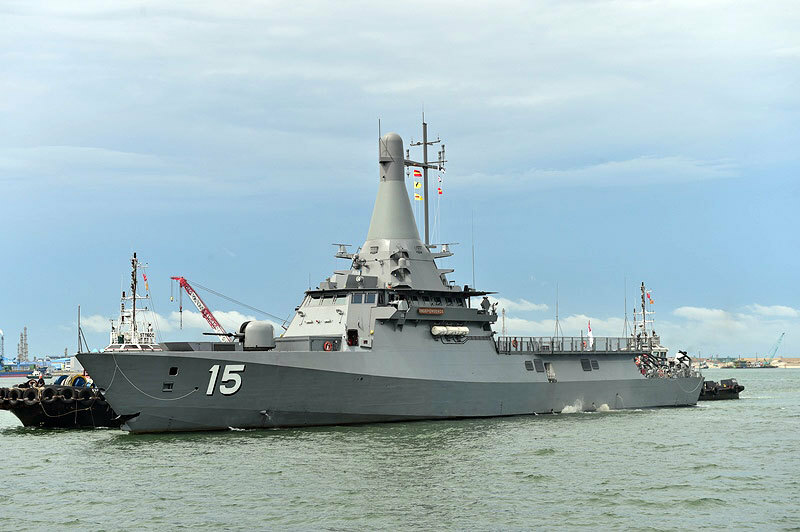 ST Marine was awarded the contract by MINDEF in 2013 to design and build eight LMVs for the RSN. The vessels are expected to be delivered from 2016. They will replace the PVs that ST Marine designed and built in the 1990s.